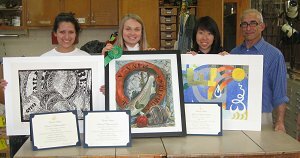 In April many New Providence High School art students were represented at "The Congressional Art Show", sponsored by United States Congressman, Leonard Lance. The show, held at Merck Pharmaceuticals in Kenilworth, featured sixty five works of art by students from twenty area high schools. One participant became the first New Providence student, and one of very few in the history of the show, to receive one of the four Congressional Award two years in a row. Three New Providence senior art students recently entered works in the annual “Clay in Mind" juried high school show of ceramics, held at Burlington High School in Burlington, New Jersey. All three students were finalists at the event, with two students receiving first place awards in their categories. 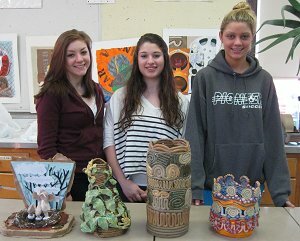 The show featured seventy-six entries from eighteen New Jersey and Pennsylvania schools. Only eight awards were presented; the first place winners will be honored at a reception at the Clay Studio in Philadelphia on May 14. 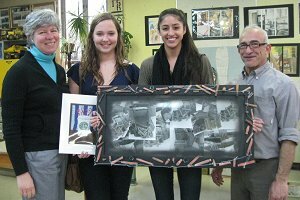 Two New Providence High School artists will soon be honored at the Morris Museum in Morristown . These students had works selected for inclusion in the Morris Museum"s "Fresh Perspectives,” a high school juried art show. This event, in its twenty-second year, showcases the most innovative artworks from high school students from across the state and recognizes art teachers for their encouragement and inspiration. The exhibition is made possible through assistance from the New Jersey State Council on the Arts and the Geraldine R. Dodge Foundation.